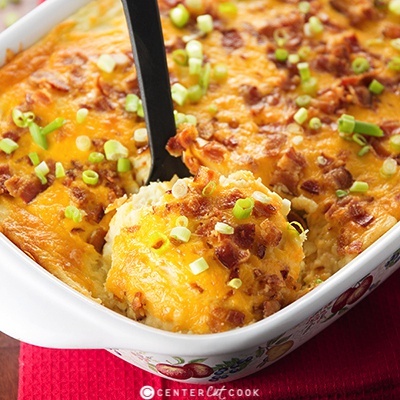 Loaded Baked Potato Casserole with crispy bacon, lots of cheddar cheese and garnished with green onion. The perfect side dish recipe and serves a crowd! With Easter and Passover right around the corner, I thought now would be the perfect time to share one of our favorite side dish recipes with you. Loaded Baked Potato Casserole is perfect alongside any protein of your choice – ham, steak, or chicken, and it feeds a crowd! Oh, and did I mention potlucks? 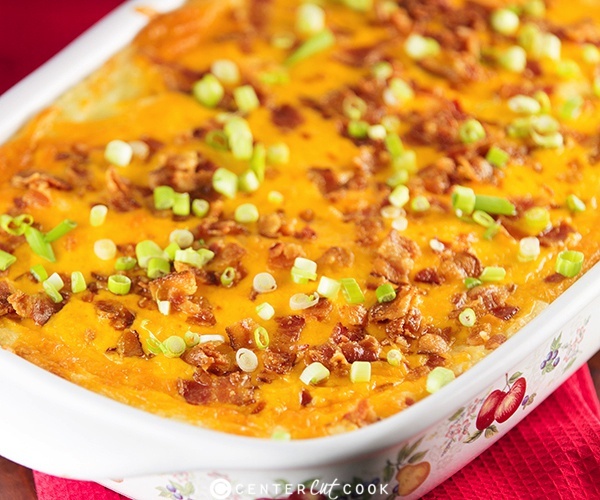 With lots of cheese and bacon, Loaded Baked Potato Casserole is one of those side dishes that everyone is going to love. The base of the recipe is none other than my recipe for The Best Mashed Potatoes. In my recipe for mashed potatoes, I use yukon gold potatoes instead of the standard russet potatoes and the result is fabulous. With lots of butter, sour cream, and cream cheese, the mashed potatoes alone are out of this world. Once you have the best mashed potatoes made, you’ll be ready to assemble this casserole. As I mentioned, there’s lots of crispy bacon and plenty of cheddar cheese. You’ll mix a little of both in with the mashed potatoes and spread them in a large 9 x 13 inch casserole dish. Then you’ll top it all with more cheese and more bacon before baking it in the oven. When the Loaded Baked Potato Casserole comes out of the oven, you’ll sprinkle some green onions on top for garnish. Doesn’t it look pretty? 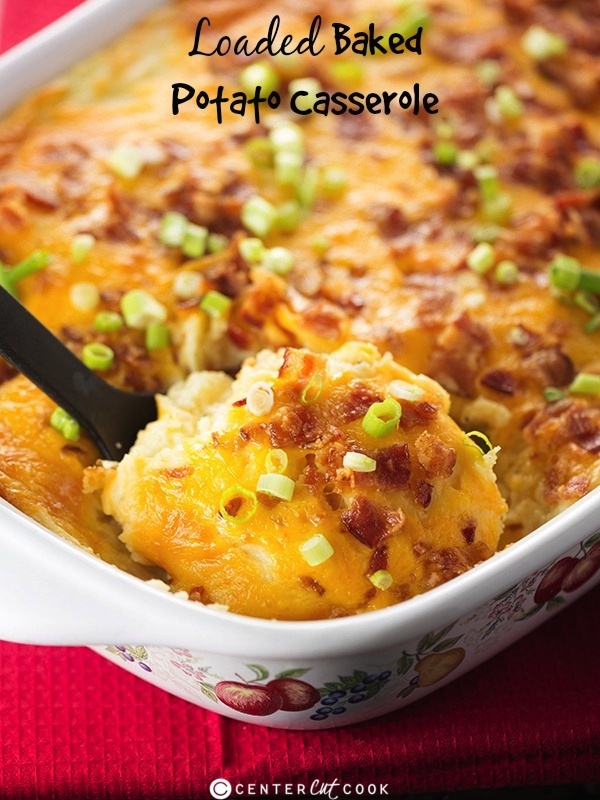 And with all of that bacon and cheese, it’s one of those side dish recipes that everyone is going to love. 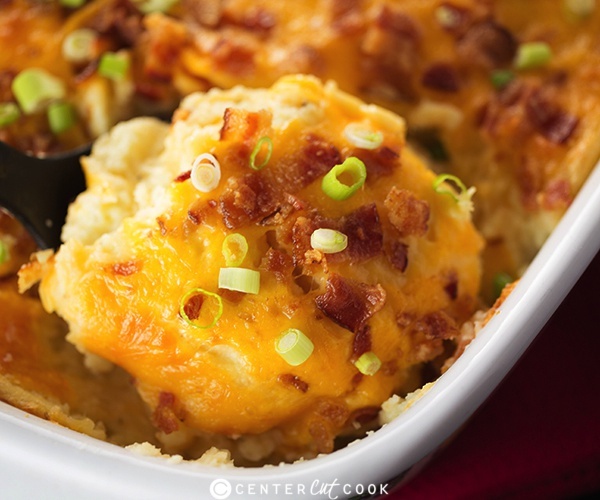 With 5 pounds of Loaded Baked Potato Casserole goodness, you’ll be able to serve 8-10+ people a good sized portion with this recipe. Whether you’re making this to accompany ham for Easter dinner, or you’re looking for the perfect recipe to bring to a potluck, look no further, this is it. Enjoy! In a large stock pot, arrange the potatoes chunks. Add enough water or chicken broth to cover the potatoes. Bring to a boil and cook for 20-30 minutes, or until the potatoes are fork tender. Drain the liquid from the potatoes. Return the cooked potatoes to the pan. Add in butter, cream cheese, sour cream, salt, black pepper, and garlic powder. Using a potato masher, mash the potatoes until most of the clumps are removed. Add in the milk, up to 1/2 cup, and continue mashing until the potatoes are smooth and fluffy. Add more milk if desired. You can also use a hand or stand mixer to get the potatoes extra fluffy and smooth. To the potatoes, add in 1 cup sharp cheddar cheese and half of the cooked bacon crumbles. Stir to combine. Spread the potatoes in a lightly greased 9 x 13 inch casserole dish. Top with remaining cheese and bacon. Bake for 20-25 minutes or until the cheese is melted and bubbly. Garnish with green onions and serve immediately.